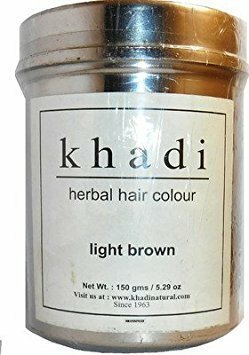 Khadi Natural Ayurvedic Hair Color gives your hair a light to medium bronze color. It can be used on grey hair. Directions for Use Wash hair with a silicon free shampoo. Mix the proper amount of the powder with warm water (50°C) until you get the consistence of yogurt. Leave it to cool down a bit and put on the hair when it is still warm (but not hot). Put on a plastic washing hat and roll a towel around your hair. Leave on the head for 30 minutes to 2 hours. Wash the dye off with warm water. Be patient - the color becomes more intensive in a few days after dyeing, because of the natural process of oxidation. Brand New Genuine Product in Latest Export Packaging. Luxurious blend of natural ingredients. Organic, natural, henna based hair color. Gives your hair a light to medium bronze color without any side effects of harsh chemicals. If you have any questions about this product by Khadi Natural, contact us by completing and submitting the form below. If you are looking for a specif part number, please include it with your message.